Providing individual reviews of the Grays GX8000 Dynabow hockey stick seemed silly. The Grays GX8000 Dynabow is part of 4 tremendous high specification Grays GX8000 hockey sticks and we would like to direct you to our range overview of the Grays GX8000 via that link. If you are just after information on the GX8000 Dynabow specifically then we have added this small overview review of the Dynabow version with key specification and buying options at our recommended online retailers. Grays Dynabow shaft shape is a great balance between low bow and higher straighter shafts. With the maximum point of the bow at 250mm up from the heel the GX8000 Dynabow is still low enough to get the great slingshot power in pushed and flicks, while high enough to not effect intricate dribbling. I would review that the GX8000 Dynabow is great for midfielders and wingers who rely on their control skills to make progress up field and often find themselves in position to shoot. As with all Grays hockey sticks, especially toward the top of the range like the GX8000, this Dynabow is exceptional quality. 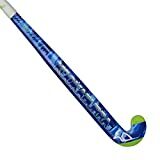 The hockey stick really feels sturdy in your hand and with added features like the AR durability zone it will last a good time too. And for more detailed review information on the Grays GX 8000 range of hockey sticks, head over to our overview.